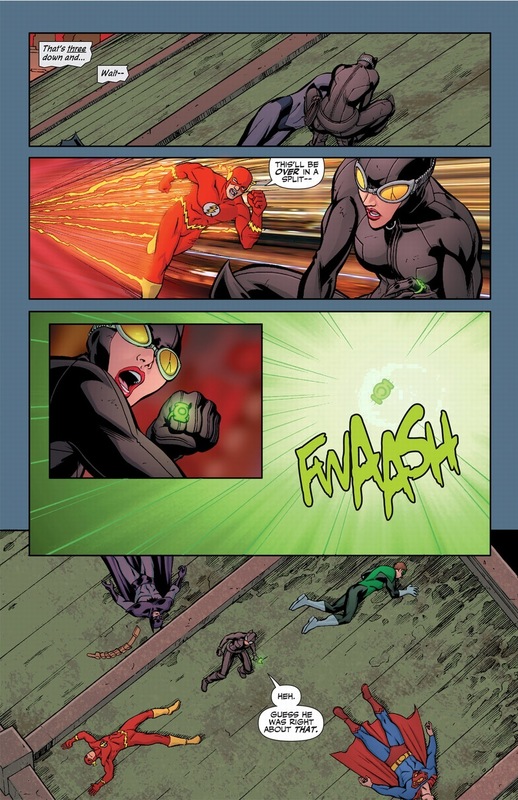 We left Catwoman last time with the delightful discovery that she can brush off bullets and punch panthers across rooms. 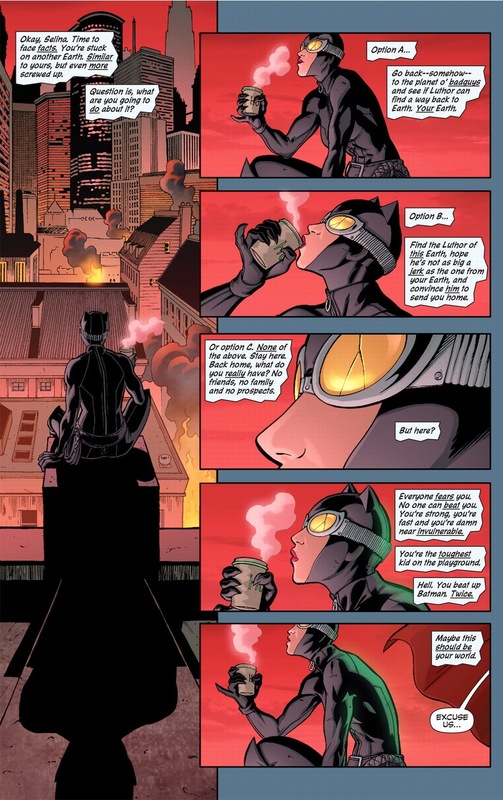 It’s good to be Catwoman. 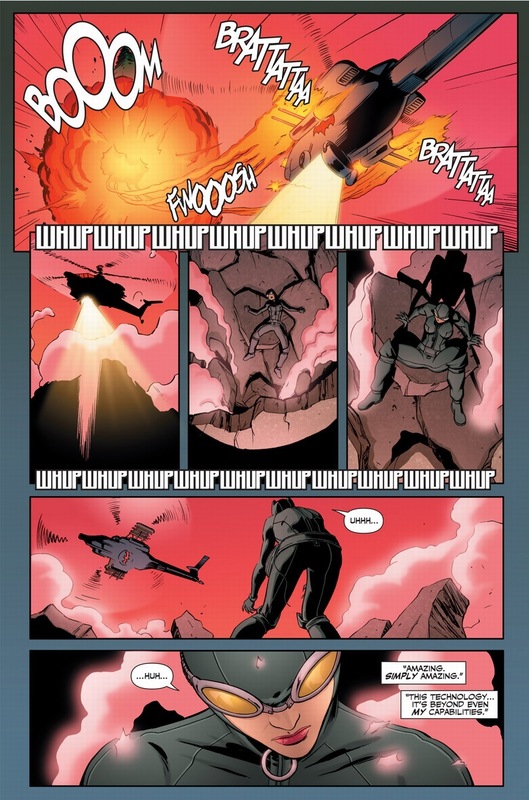 And in this weird alternative Earth of hers, what’s not to enjoy about being indestructable and all-powerful? That’s right: nothing. 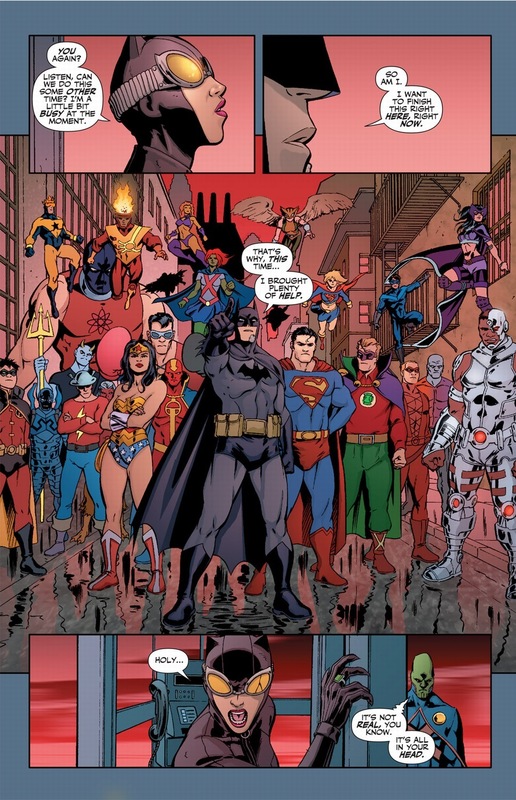 Unless you happen to be the buzzkill of the DC universe. In all the chaos of teleporting the bad guys to the planet Salvation, one Justice Leaguer also hitched a ride. You know the best part of superpowers? The freedom. No longer does one have to cartwheel and backflip out of the way of normal death machines. Or hide and cry if one’s not an Olympic-level vigilante. 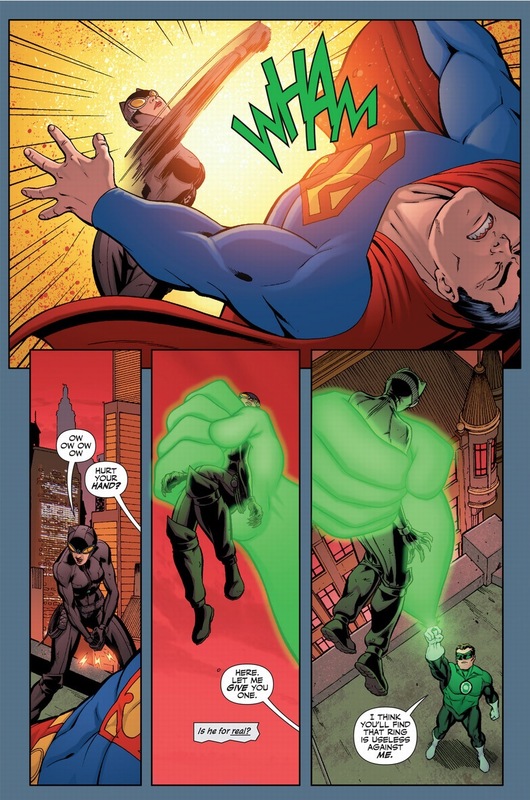 So let this alternative Earth’s Batman try to uncharacteristically mow down our protagonist. Let him try. Can you already feel the joy coming from our dear Selina? 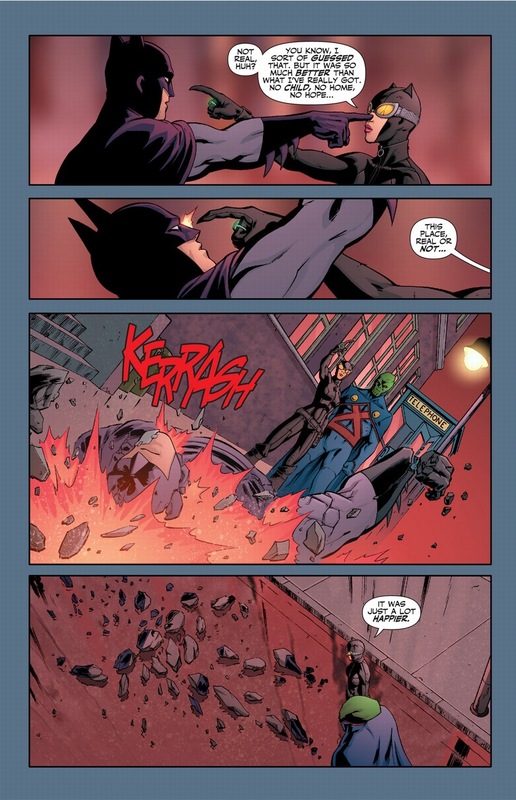 Remember when Batman went crazy and slightly evil because he suddenly had the ability to protect everybody in the world and his overwhelming/warped sense of justice forced him to do so? 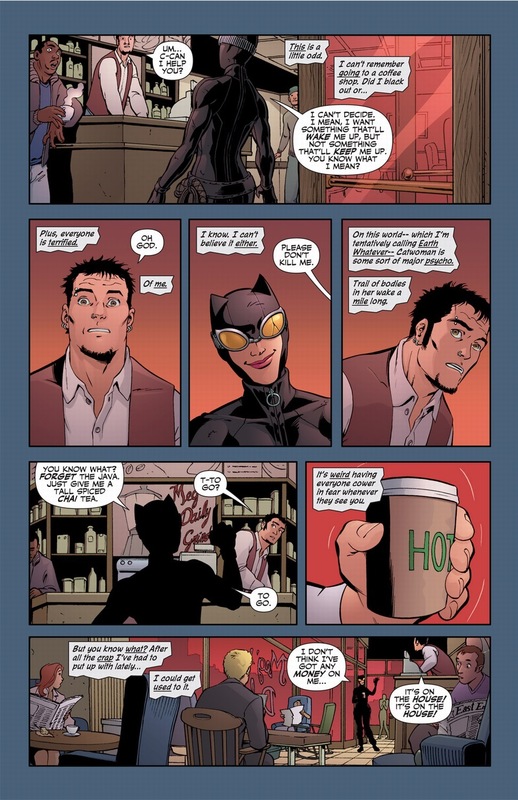 Catwoman’s not wired that way. 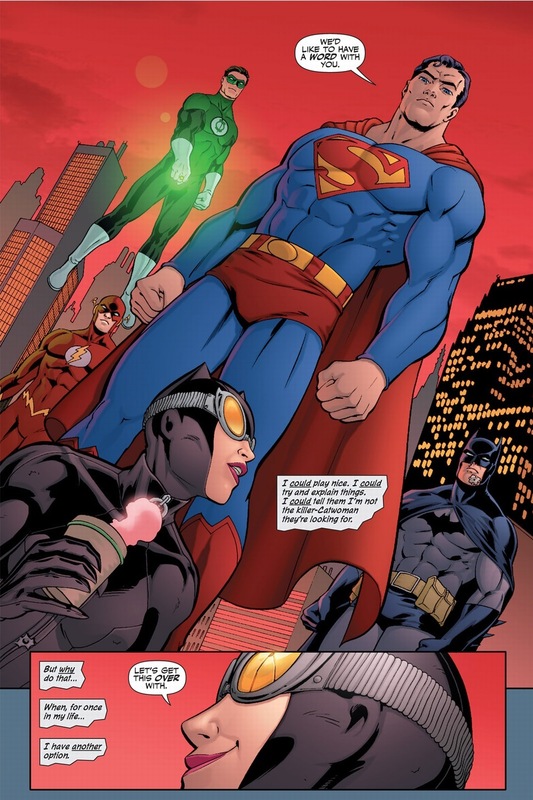 She can be things Batman can’t, like happy, and more importantly, all the joy you and I would feel from being infamous, invincible, and not caring about anyone who wanted to do silly futile stuff like stop us from doing whatever we want when we want to do it. How good of a mood does one have to be in to see Superman and figure, y’know, why not? Let’s take him. Back home she had her friends and belongings taken away by people who want to kill her then teleported to a prison planet to waste away with other baddies, but here? Oh, the freedom. 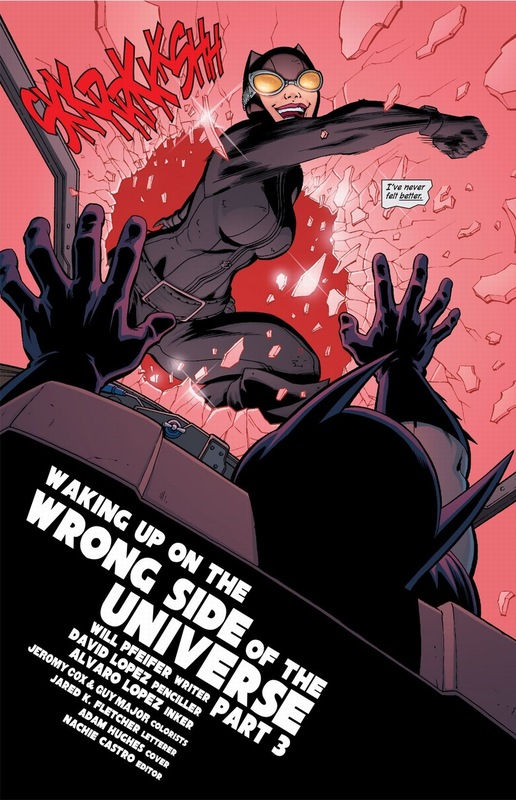 It’s basically a world created from her current deepest desire — a perfect world for the crap Catwoman’s current going through (which, and spoiler alert, it sort of is exactly that). 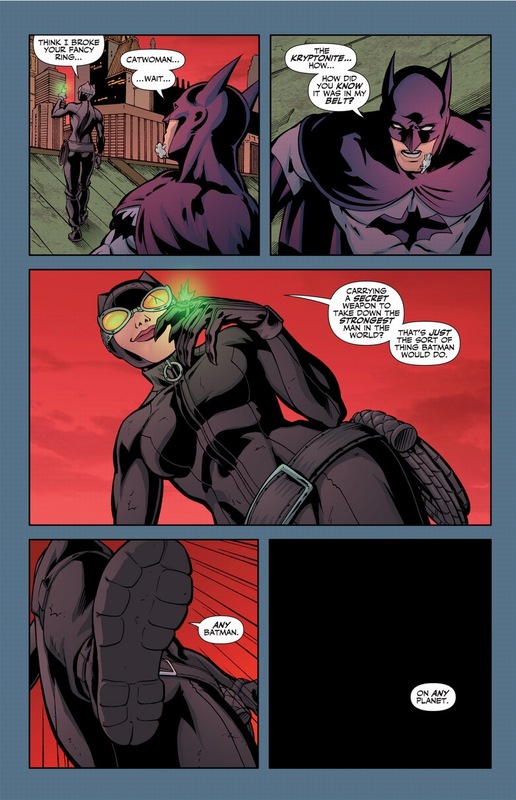 Because in what other scenario could you possibly imagine where Catwoman does this? 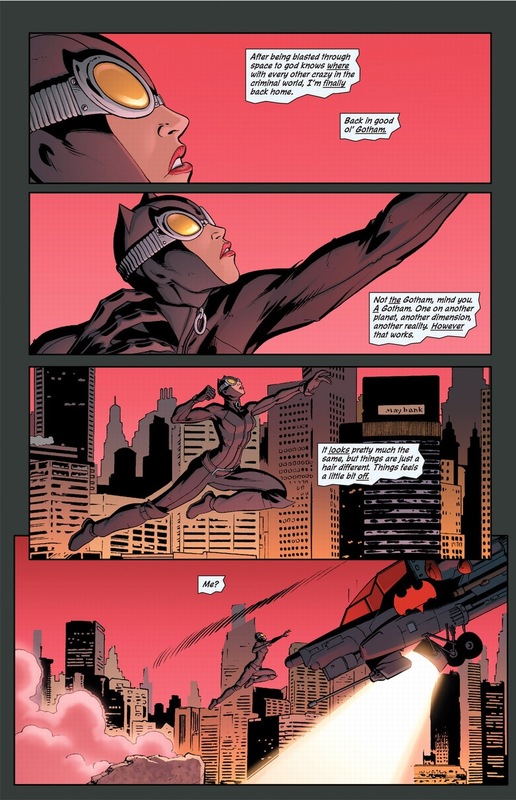 We can use the same summary we use about Daredevil comics of the past three to four years: sometimes it’s just nice to see Catwoman win, because those last dozen issues or so before this arc have been rough for the poor girl. 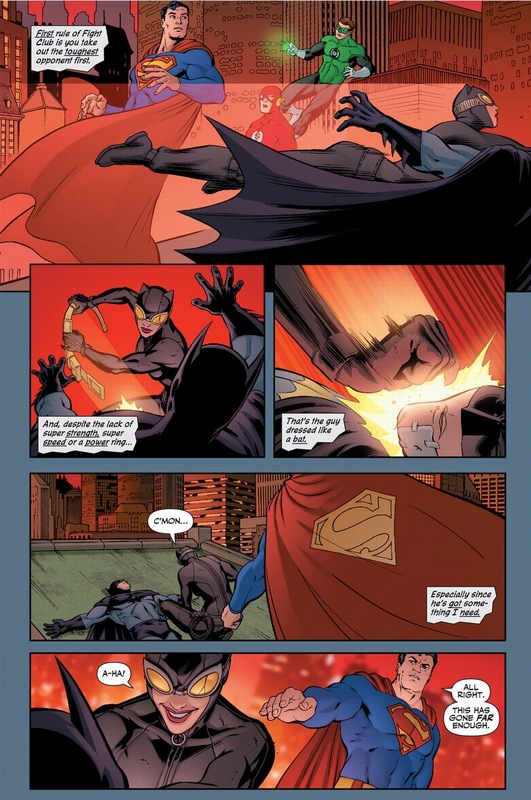 Plus, this is the third time she’s beaten Batman — which might be saying more about her fantasies than anything else (I’m just saying, in the most non-offensive way possible, that the whip of hers isn’t just for crimefighting). And as for the icing on the cake? Don’t think we’ve forgotten about our green buzzkill earlier. 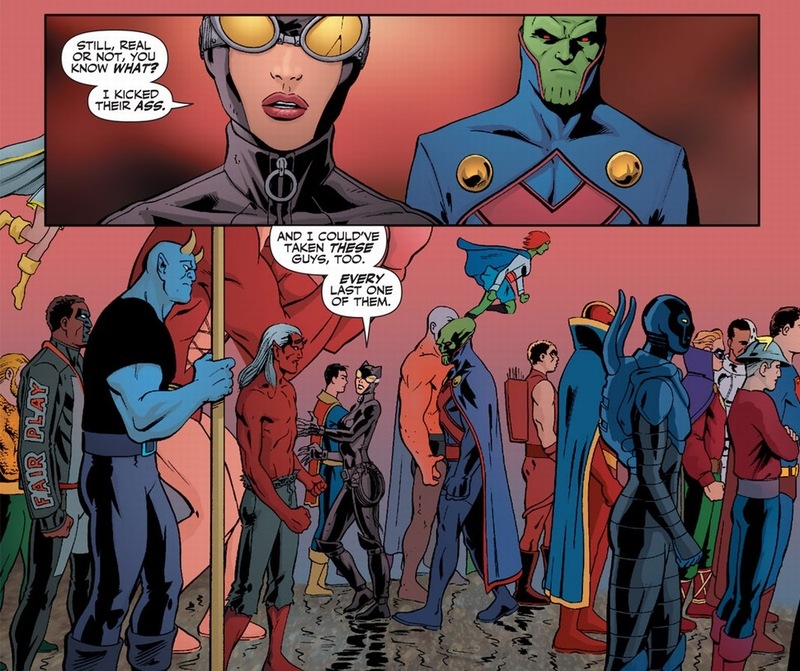 I know it’s to save her life and bring her back into the real world so she doesn’t die in a desire-driven alien machine, but Martian Manhunter can be such a downer sometimes. 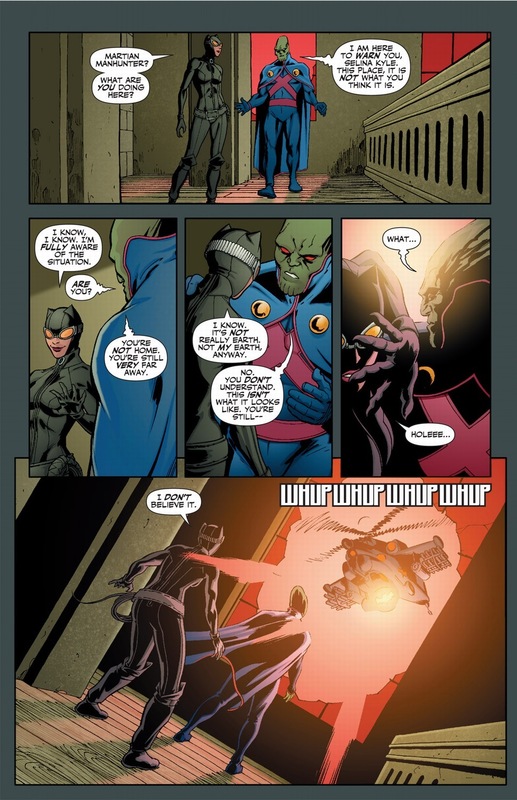 As Catwoman accepts the reality of her situation, at least she recognizes it like the badass she is. That’s all I ever want in a comic book character. I briefly mentioned before that someone torched all her belongings earlier. Next time, she gets her revenge. It’s going to be bloody. 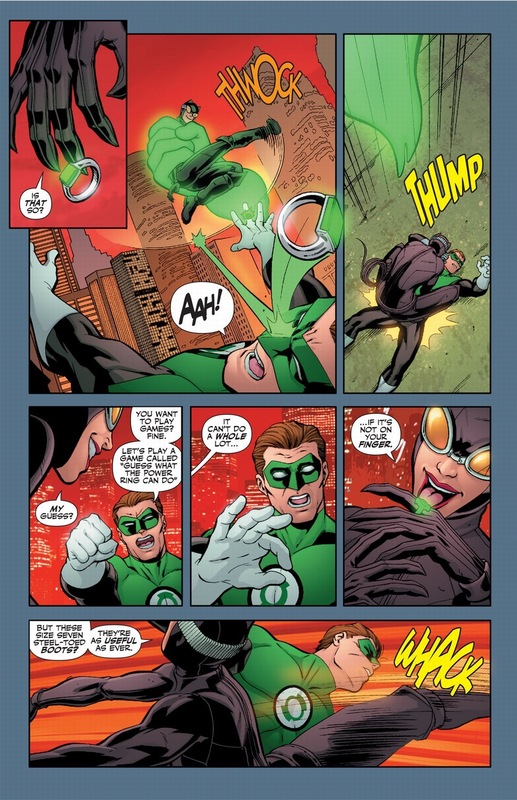 The irony of Selina taking out GL with a green ring is delicious.